Arthive is one of the most popular art projects. 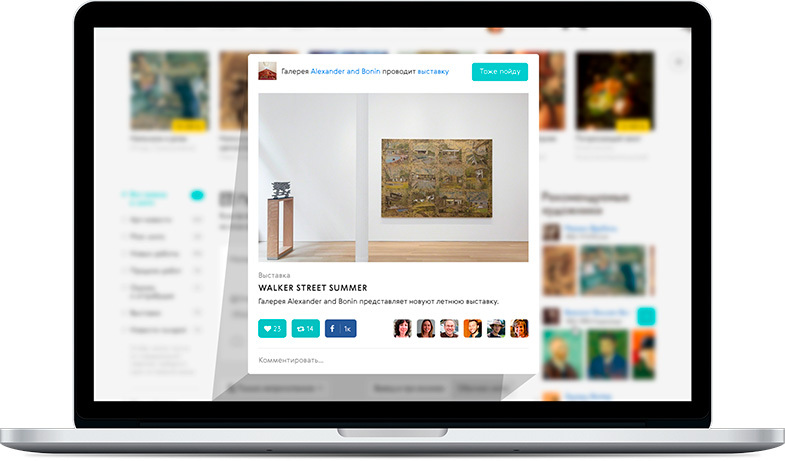 Our solutions help art market participants manage collections and hold sales, and help art connoisseurs find interesting artworks and discover new artists. More than a million people use our products every month , people with a passion for art. We know what kind advertising interests them and how to do it. Our editors are involved in preparing all ads. That's why they're interesting to read and far more effective than boring press releases. These are special projects carefully prepared by our editors. Each week has its own page, it's announced by an end-to-end ad unit for a week, and can include up to 5 publications, videos and tests. See what it looks like: here and here. It's an interactive format, where the audience learns about artworks, stories and creativity. 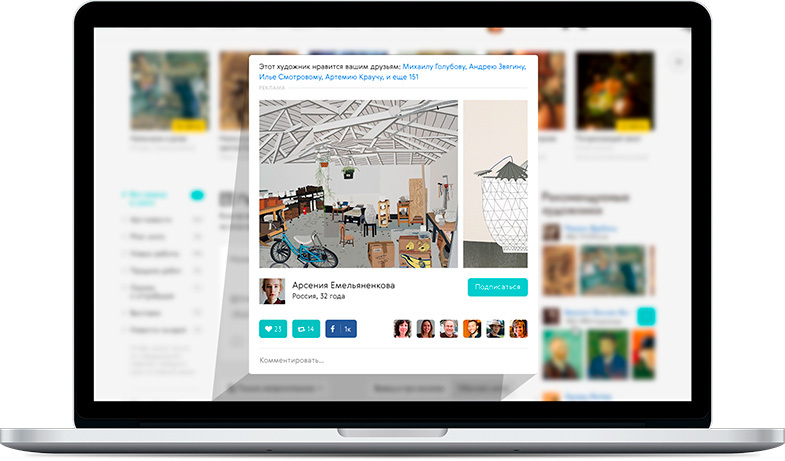 Users can only advertise specific objects in the feed: artists, galleries, museums, exhibitions or specific artworks. That's why these ads look natural and are edited. The cost of placing an ad in feeds is paid for views by each unique user. You can select a region and limit the budget and time for views. The other system settings are configured to show the ad as effectively as possible. It attracts subscribers to the artist's page. It's shown in user feeds on the website and in the mobile app. It highlights artworks and collections offered for sale in Arthive. It's shown in user feeds on the website and in the mobile app. It attracts subscribers to the pages of galleries and museums. It's shown in user feeds on the website and in the mobile app. 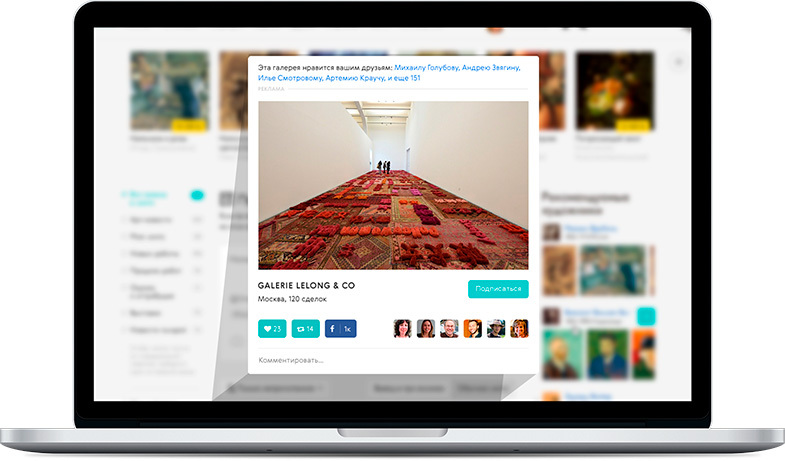 Galleries, museums and artists can announce exhibitions on their pages. An ad for an exhibition in the feed attracts more attention to both the exhibition and the organizer's page. Mobile users make up more than half of our audience, use more products and respond more. So along with our basic app, we've also created a mobile app constructor for artists, galleries and museums. Mobile users make up more than half of our audience, use more products and respond more. So along with our basic app, we've also createda mobile app constructor for artists, galleries and museums. Individual apps for an artist, gallery, museum or exhibition can be released for iOS and Android devices. Get more details on the features of apps for artists here, and apps for galleries and museums — here. 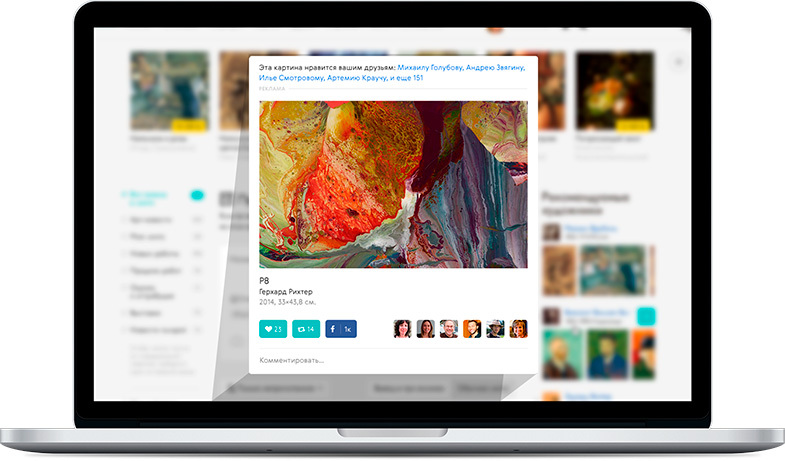 We use our constructor to release mobile apps about great artists, collections and art styles. Each app has a base of artworks, editorial descriptions, interesting facts, a layout of the objects and a biography. Ads in these apps are always customized: from partner apps to sponsorship. If you're running an interesting exhibition or amazing project about art or something else, we're willing and able to be your information partner. Any artist, gallery or museum can publicize their exhibition in the "Exhibition" section. It's free if you have an Arthive page. We can announce it in a news feed and in social media as an information partner. We'll advertise non-commercial projects about art, talented new artists and much more for free. What's important is that it's interesting to our readers. If you can't afford buy advertising with us and you're sure you have something really interesting, write to us! We have no bureaucracy or setup for selling advertising. We'll write about your project in detail if it interests us. And we usually do these placements as a partnership.